Self-driving, automated cars are coming. There will be teething pains in many forms: Some people will want highly automated vehicles while others will fear them. Some will be privately owned, and others will be taxis and shuttles for use by different people every day. What’s largely unappreciated yet important is that leaders in urban regions need to prepare for two separate, competitive streams of vehicle automation. One stream lets automation assist the driver. A second stream has no driver. Not recognizing the distinction can result in confused predictions and ineffective public policy. Stream 1, the advanced self-driving car that still has a human driver at the wheel, will be in auto dealerships around 2020. Early innovative versions in high end cars, such as Tesla with Autopilot, or Volvo with Pilot Assist, can be purchased now. In the early 2020s, driver assistance technology in all price ranges will be astonishing, making driving on limited-access highways safer, more comfortable, and safely supportive of a lower but still mindful focus of attention while operating a car. On urban streets with crossings, signals, left turns, driveways, double parking, bicycles, and pedestrians, automated driving will arrive later. Sophisticated assistance to drivers is mostly what vehicle automation represents for the next decade: cruise control on steroids. Automatic, radar-activated braking will reduce collisions with pedestrians, bicycles, and other motor vehicles. Making collisions impossible is today’s engineering goal as older cars are retired from the consumer fleet. The Highway Loss Data Institute (HLDI) has already found that today’s very early versions of front crash prevention systems lead to insurance claim rates that are 10 to 16 percent lower for vehicles equipped with both driver alerting and automated braking, and 7 to 22 percent lower for vehicles equipped with a warning system only. Stream 1 automation for many more years will still require that a human driver remain awake and responsible for the inevitable situations that automated control fails to handle, such as new roadway sinkholes that electronic maps and in-car sensors do not notice and behavior of other motorists that is unusual, sudden, and irrational. However, levels of driver distractions like those that now commonly occur –-- looking away from the road for over two seconds, for example --- will be more safely tolerated in future semi-automated cars. This level of distraction is so pervasive a human condition, indeed, that meeting zero fatality goals will be impossible without robotic autonomy that compensates for the error of insufficient driver attention. Rear-end collisions and drifting out of lane---commonplace with today’s smart phone distractions---are going to be snuffed out via automated driver assistance as older cars are retired from service. Stream 1 promotes continued vehicle ownership, and is not particularly disruptive to existing patterns of vehicle use. It’s merely a nicer version of your current car. Government oversight of motor vehicle safety should not constrain, but rather encourage the roll out of the new safety features. The current regulatory framework can be successfully managed within existing processes of government departments of transportation, vehicle and operator licensing authorities, and urban planners. In general, instead of new regulations, only fine-tuning of today’s rules is needed. Stream 2---the completely automated car---is not a consumer purchase now and may never be. Having no driver is its essence. The fully automated driverless vehicle will inevitably evolve toward these vehicles having commercial and other institutional owners for the purpose of providing on-demand ride service for any passengers, with or without a drivers’ license. Passengers would have no responsibility for operating the vehicle, like with a bus or taxi today, but now without a human driver. Stream 2 represents a widening path of disruption in automobility already begun by the likes of Uber and Lyft, Car2Go and ReachNow. This disruption will decisively arrive in the form of cars and mini-buses without a steering wheel and foot pedals. To get into service quickly and safely, the first street-legal Stream 2 versions will be traveling on limited, pre-defined routes on public streets and roads with government regulatory clearances following months of planning. In what’s called by the U.S. Federal Government a limited “operational design domain,” these vehicles will provide new opportunities for local mobility. Dozens of local officials throughout the first world’s urban regions have already begun to discuss with consultants and vendors where and how Stream 2 services would be usefully deployed. Government oversight should not discourage deployment of automated vehicles without drivers. Rather it should accelerate the potential for reducing the percentage of single occupant vehicles (SOVs) on streets in all kinds of low speed environments, from congested areas within the densest city centers to suburban residential areas where public transit is now impractical. Uber’s semi-robotic taxis in Pittsburgh and Arizona are still Stream 1 technologies, but are trying to make the jump to Stream 2. They are beginning with drivers in the usual position keeping watch on not-quite-ready automation systems, and who are always ready to take over control. So far, human driver intervention remains frequent, around once per mile on average. The future date for successful transition of early trial semi-robotic deployments to completely driver-less operation on even a small portion of a metropolitan street grid is uncertain –-- although several manufacturers promise by the early 2020s. Operating a region-wide commercial service without drivers may take years of testing and safety certification. Slow-moving mini-bus shuttles staying under 25 mph in a curb lane are easiest to deploy first, and are being tested already in Asia and Europe. A limited version is just now being tested in Las Vegas ahead of passenger service said to be coming within months. Stream 2 requires a combination of impeccable up-to-date digital mapping, well-maintained lane markings and signage, all within bounded operating areas. There will be remote human oversight. Governments at all levels are most unlikely to allow autonomous vehicles to roam unmonitored. That’s sensible public policy. In contrast, because human driving remains available, vehicle owner-drivers in the less controversial and high-momentum Stream 1 of driver assistance will be able to travel on all types of roads, a practically unlimited operating domain. The auto industry is trying to enable drivers to gain swaths of time to do limited non-driving tasks on limited access highways. Less attentive driving has the potential to become safer, with crashes from driver error less common. The inevitable years ahead for roads that mix automated and non-automated vehicles will challenge and delay the full potential for mitigating distraction. Stream 1 drivers with automated assistance will more easily tolerate longer distance commutes that let them access lower-cost housing and closer proximity to outdoor recreation. The daily grind of congested commuting from suburbs to downtowns could be significantly eased for drivers of highly-automated vehicles, who can then focus on non-driving activities. By making car travel easier, Stream 1 will be a force of unknown magnitude for making urban areas spread outward. 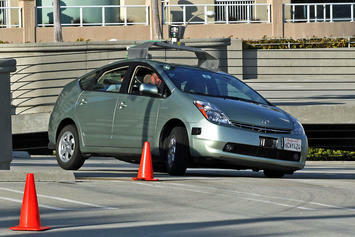 Traffic could increase but would move more smoothly because of automated control assistance. Many consumers will embrace Stream 1, so it will not initially reduce parking demands in our residential areas, employment centers, or shopping districts in the way the slower-arriving Stream 2 promises. Stream 1 automated driver assistance appeals to the sense of autonomy and control that comes with car ownership. The driverless Stream 2 supports the rising attraction of efficient ride hailing, ride sharing and taxis. Both are coming, with Stream 1 having the advantage now. But which path of innovation will dominate in the 2020s? Stream 1 automated driver assistance has no deployment barriers. It’s simply your next car purchase or the one after. It conforms to every purpose and role that your family vehicle now plays: habit, status, privacy, security, and the sense of assurance you get from owning a car as you and your parents long have. The full automation in Stream 2 faces a series of obstacles to everyday use, with gaps in technological capability an even bigger issue than regulatory barriers. For Stream 2 to be realized, drivers must become completely redundant in all circumstances within a geographic range of service. Even with machine learning in computer algorithms, that’s a tough goal. Reaching a near-error-free level of robotic motor vehicle operations over a broad geographic region at the human level of 100 million miles between fatal incidents may be inevitable, but the number of years to get Stream 2 cars to be this safe is still uncertain. Eventually, Stream 2 will become the taxicab, the Uber, the Lyft, the ReachNow, and the city bus of the future, reducing operating cost by eliminating drivers. Stream 2 will be battery-electric powered for operation that is quiet, non-polluting, and energy-efficient. Optimists for the automated vehicle’s future are enthusiastic about their potential for making car ownership unnecessary for many people. But wait. Consumers will shift away from car ownership only as new Stream 2 on-demand mobility services emerge as suitable for the wide range of personal desires and needs that exist within any typical family. That will require new levels of affordable vehicle availability, range, responsiveness, convenience, choice, comfort and personalization not currently available today, and also not easily reached in the early years of Stream 2 robo-cabs. Stream 1 is familiar and can be safely left to new car dealers and existing motor vehicle regulations policy. Stream 2 breaks with current practice, however, providing the biggest opportunity for congestion reduction in the long run. This is where regional and local governments need to focus now by encouraging, facilitating, and funding demonstration projects of the driverless vehicles available now. Submitted by davebarnes on Thu, 04/13/2017 - 09:13. Starting in 2070, cites will will begin shutting down public transit rail lines. Bus routes will have collapsed earlier.